Dental implants are prosthetic elements used to replace missing teeth or to stabilize removable dentures. The implant is the infrastructure that supports the crown or firmly holds a removable denture in place. It resembles the root of the tooth and it is threaded or tapped into the maxillary bone. Implants are made of titanium which gives them an important characteristic: they can be “osseo-integrated” to the bone (i.e., the implant essentially becomes one with the bone). Dental implants are a specialty at Drs. Pelcman’s practice. Buenos Aires cosmetic dentist Dr. Samuel Pelcman was a pioneer in implant dentistry. He began performing dental implants in Buenos Aires in 1985, and received specialized training in the USA. He has been the representative in Argentina for Park Dental Research Corp., New York since 1992. Dr. Pelcman has successfully performed more than 40,000 Buenos Aires dental implant procedures and numerous grafts and sinus lifts. The treatment with implants can be classified as immediate or mediate. In the first case, a temporary tooth is attached to the implant after it is inserted. Three months later, the crown is made for that implant. In the second case, the implant is inserted in the bone. Nothing will surface out of your gums and a temporary tooth will not be attached until 3 months after the surgery (until the implant is osseo-integrated). After the 3 month waiting period, the implant is activated; this means that the top of the implant is exposed and an abutment (the element that connects the crown to the implant) is threaded or cemented into the implant – and the crown is then made. You might wonder why dentists don’t always apply the immediate system as it is more convenient for the patient. Dentists always try to do the best for the patient, but the fact is that immediate implants are not always the most appropriate solution. You can make an online consultation in order to know what treatment is best for your case. Upon your arrival in Buenos Aires you will first have a consultation with Drs. Pelcman’s Practice. In this appointment, you will get to meet Drs. Samuel and Martin Pelcman and the staff, see the facilities and submit to some pre-surgical studies. You will be given a complete briefing on the diagnosis, informed of the treatment plan and provided with a written cost estimate for the treatment. The Buenos Aires dental implants treatment is divided into two stages. The first corresponds to the insertion of the implants. For this part of the treatment you would need to stay in Buenos Aires for at least a week. The second stage includes a waiting time of 3 months, after which you return to Argentina to have the implant activated and the crowns (or removable dentures) placed. This waiting time is necessary to allow your bone to integrate with the implant. The amount of time that you would need to stay in Argentina for this second stage depends on the number of crowns or removable dentures to be made; normally it ranges from one to two weeks. Argentina dental implants surgery is performed with local anesthesia and under sedation (if necessary), assuring a pain-free procedure You will note that our surgery facilities and all surgical instruments are, prior to each surgery, completely sterilized and protected to the highest professional standard. The surgery for one implant normally takes no more than 30 minutes. In order to insert the implants, an incision is made in the gums to expose the bone. Perforations in the bone are made with a surgical drill and the implants are threaded or tapped into the perforations. Finally, the incisions are closed with surgical stitches that will be removed five days after the surgery. You may wear your old denture after it has been adapted by the dentist once the surgery is over. A temporary removable denture may be prepared. Temporary dental crowns may be attached to the implant after the surgery (immediate implants). When large bridges have to be made and if the patient has firm teeth or healthy roots, they may be used as anchors for the bridge (this may present an advantage sometimes). In the case of the roots of damaged or restored teeth being used, root canal therapy would need to be performed and a post would have to be made. 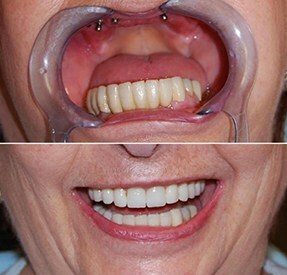 In regard to removable dentures, the second stage differs according to two different situations: when the patient has his own denture and wants to attach it with implants, or when the patient wants to have a new denture made. In the first case, the second stage consists of the activation of the implant and the installation of an attachment system. In the second case, the second stage consists of preparing a new removable denture and the installation of the attachment system. At Drs. Pelcman’s Practice, Straumann (also known as ITI in the EU) implants from Switzerland and Nobel BioCare are used. In this particular situation, one of the many advantages of these brands of implants is that they can be activated anywhere in the world. If you are unable to later travel to Argentina, a qualified dental professional may complete the treatment in your home country. After the surgery pain is usually minimal and it is controlled as required with analgesics that will be prescribed by the dentist. In order to reduce the inflammation, you can apply cold compresses to the face or you may eat ice cream, placing it so that it melts on the wound (of course, the ice cream is a more entertaining choice). If antibiotics are prescribed, take them as indicated. Sinus lifts are surgeries with the goal of increasing the amount of bone in the back of the maxillary bone so that implants may be inserted. In bone graft surgeries, a piece of bone of the patient is relocated and attached with surgical screws to the desired area. The objective of this surgery is to increase the amount of bone. It can be used to insert implants or to heal bone defects (e.g., periodontitis). Accomplishing your oral health goals and obtaining the smile you desire requires constant communication between dentist and patient. Clear and concise communication with the dentist helps to assure the outcome that you are seeking. To help you with this, Dr. Pelcman and key members of his professional staff are fluent in English. It is also important to understand the limitations of the dental implants treatment, and be realistic about the outcomes of the procedure. Your anatomic features play a role in the treatment. An evaluation by Dr. Pelcman will determine if you have sufficient bone structure and quality to sustain the implants. Grafts and sinus lifts may be performed to make up for the lack of bone structure. Dr. Pelcman is an expert in such procedures, with many years of experience.